Roughly into my second year of quilting, my mom kind of jokingly asked when I was going to make her a quilt for her bed. So I eventually came up with an initial design and bought a boatload of fabric in early 2009. However, during the course of the year I kept changing my mind about the quilt design because the fabric and the designs didn't work. I couldn't find the right fit between the fabric, what I thought was my mom's design and color sensibility and my skill level. However, I finally settled on the Jacob's Ladder Jewel Box classic block. [Thanks, Barb, for reminding me of the correct block name.] I think finally settling on a design took 4 months. 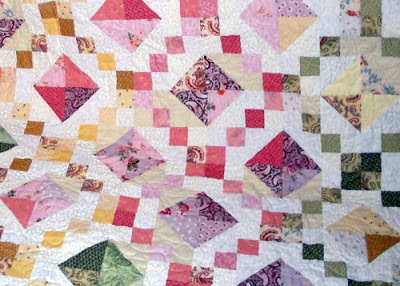 Then I thought that I would just start piecing the blocks together, but I realized that I couldn't be as improvisational in the piecing as I initially thought I could because of how the colors wanted to play with each other. So that meant covering the floor of my small living room with lots of quilt blocks for a looong time and more indecision. That took about another 3 months. Well, finally, I pieced it together and I flirted for a brief moment about quilting the behemoth on my domestic sewing machine, but sanity prevailed. The quilt top then sat, and sat, in the trunk of my car waiting for me to take it to a long-armed quilter, which I finally did. Because by that time I had missed my self-imposed Christmas 2009 deadline and then my parents' anniversary in March. I had to finish it by June 2010, my mom's birthday, because otherwise I knew that I would never ever finish it and would become the work in progress that would haunt me for the rest of my quilting days. The quilter did a fantastic job and I learned a lot about accurate cutting, accurate piecing, sewing on the bias, the importance of 1/4 inch seams, and the challenges inherent in working with large pieces of fabric. Since making that quilt, I have felt more confident about working on larger quilts and think that the quilt was an important milestone in my quilting journey. That was a lot of work, but it was worth it. It's lovely. Sometimes the most beautiful results come from lots and lots of deliberation and experimentation. This is just lovely! I take ages, and many cups of tea to make decisions about what to do with my quilts. You made all the right decisions because this quilt has turned out so well. Your mum must be so happy with it. It's beautiful! And it's not still in the back of your car as a WIP! :) I know your mom must love it knowing how much work and thought went into it. A beautiful soft pastel quilt! Love it! Bet your Mom does too! 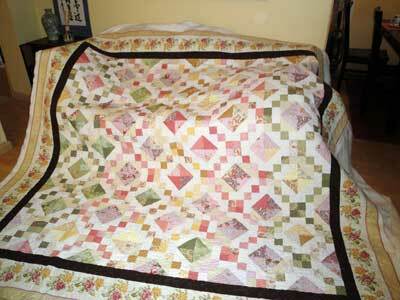 What a nice jewel box quilt! Your color placement is wondderful! What a pieceful, comforting quilt. I'm sure your Mum enjoys it. And glad you learned from it and it is finished. Hi! This quilt really is a jewel! Just lovely! I really like how the different colours works together. 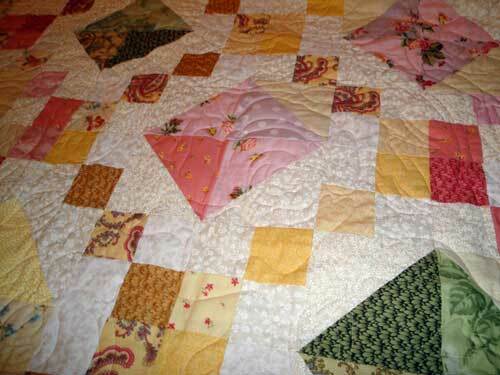 I think, that spending more time making a quilt,gives it more value. Thank you for sharing! This is one gorgeous quilt. Your planning and working with it for so long, really paid off. It is to be cherished. I am doing one very similar to this for my son as we speak...just need to put blocks together. Thanks Barb for giving me the correct name b/c I thought it was Jacob's ladder, too. It is a lovely quilt...I am not brave enough for king size yet, but maybe one day!